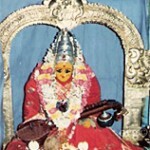 Basar boasts for the only Saraswati temple in the entire peninsula. The Andhra Pradesh government has take steps to provide more amenities near the temple. As Adilabad and Niamabad districts lie on the border of Maharashtra, there is a large influx of pilgrims from those parts as well as other parts of the country and Andhra Pradesh during the bi-annual festivals in February-March and September-October. Infact, many pilgrims get the “Aksharabhyasam (learning to write the first letter)” done for their children at the temple, irrespective of whether such an exercise was gone through earlier or not. Basar is a station on the Secunderabad-Manmad railway line. A day train shuttles between Secunderabad and Basar, the nearest important town in Nizamabad is well connected by rail and road and is a four-hour journey from Hyderabad, the nearest airport. Basar can be reached by road from Hyderabad in five hours. This entry was posted in Andhra Pradesh, Basar. Bookmark the permalink.